iLoveToCreate Blog: Inspiration from our team! 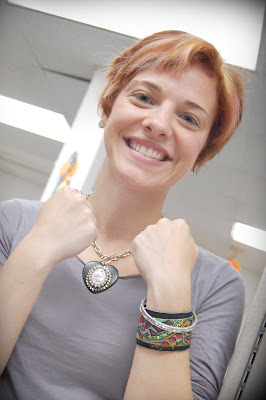 Check out this awesome cuff bracelet that Lauren, one of our new product development managers created! Isn't it awesome? She created it using some strips of leather sewn together along with Tulip® Soft Fabric Paint and super sparkly Tulip® Glam-It-Up™ Iron-on Crystals™. 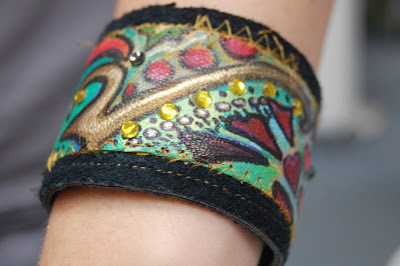 Her finished project turned out super high-end, like something you would get in a boutique! Here she is modeling her creation. Great job Lauren! Truly fabulous!! I'm going to need one of those! !Thank you so much for sharing!